The Back Bay was designed to include a series of alleys that run behind the houses. These alleys originally were intended for deliveries, which could be received directly into the kitchen areas, usually on the ground level in the back of the houses. Today, the alleys serve as access to parking areas behind the houses and, on occasion, to the primary entrance of apartments or condominiums in subdivided buildings. The alleys are 16 feet wide, including sidewalks on both sides (frequently occupied by dumpsters or by automobiles parked illegally so that they extend to the curb). Between Arlington and Massachusetts Avenue, the alleys run east-west and each block has a different Public Alley number. 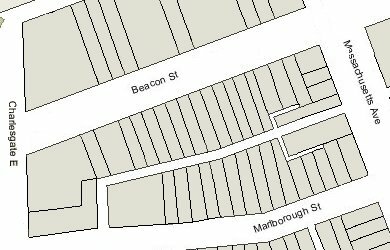 The alley numbers between Beacon and Marlborough increase each block to the east from Massachusetts Avenue to Arlington (Alley 414 to Alley 421). The alley numbers between Marlborough and Commonwealth decrease each block to the east from Massachusetts Avenue to Arlington (Alley 422 to Alley 429). And the alley numbers between Commonwealth and Newbury increase to the east each block from Massachusetts Avenue to Arlington (Alley 430 to Alley 437). The alleys system continues west of Massachusetts Avenue, but in a modified arrangement. Alley 908 runs west from Massachusetts Avenue between Beacon and Marlborough, but ends at the eastern property line of the Barnes Mansion condominium at 10 Charlesgate East. At that point, it turns south and continues to Marlborough. Alley 905 runs west from Massachusetts Avenue between Marlborough and Commonwealth to the rear of 428 Marlborough and of 379 Commonwealth. At that point, it turns north, narrows to fourteen feet in width, and runs to Marlborough (between 428 and 430 Marlborough). A five foot wide branch continues west behind 430-440 Marlborough to the north and 379-389 Commonwealth to the south, where it stops. 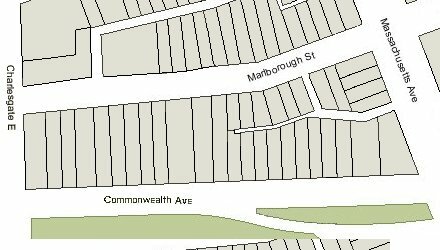 Each Commonwealth Avenue lot further west, starting with 393 Commonwealth, extends north to Marlborough, with no alley. Alley 918 does not connect with Massachusetts Avenue, but rather runs between Commonwealth and Newbury starting at the east behind 378 Commonwealth and ending at the west at The Somerset at 400 Commonwealth. On the east, from behind 378 Commonwealth, Alley 917 runs from Alley 918 to Newbury; to the west, Alley 919 runs behind the eastern side of The Somerset to Newbury.